10 of us walked across Bigmoor from the Barbrook area taking in Bronze Age burial cairns, revetted cairn, embanked stone circles then over to the ridge above Swine Stye to see some more burial cairns and cist burial and Bronze Age field systems, much more noticeable following last summers fires and some interesting 18th century way markers. Finally, down to the site of Swine Sty's settlement and shale bracelet manufacturing site before returning to the cars. Tues. 12th March - 19:45 Dore Old School -Follow The Yellow Brick Roads-David Inglis gave a talk on - The developments in the story of Roman Brough/Navio after last season's exploration. 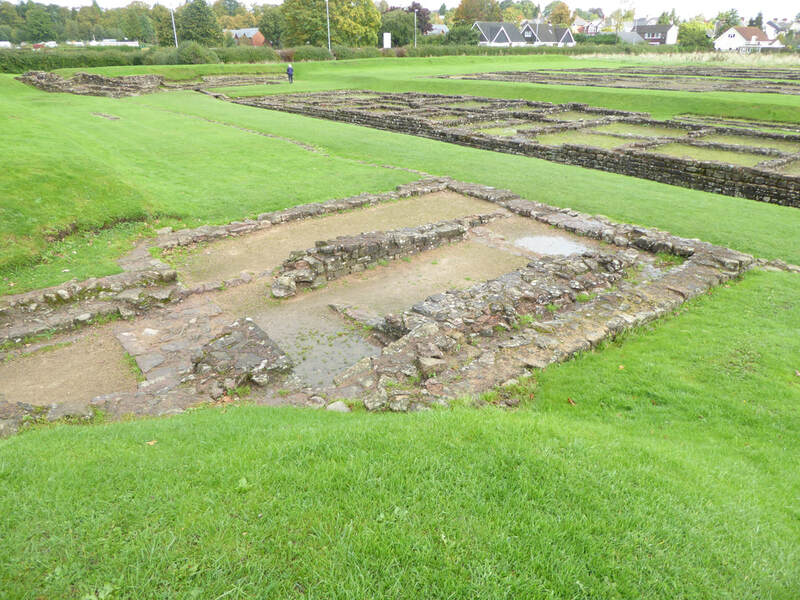 This talk charted the history of archaeological investigations into the Roman Roads linking the forts in our region. Big thanks to David for an interesting talk. * An opportunity to talk about all things archaeological. 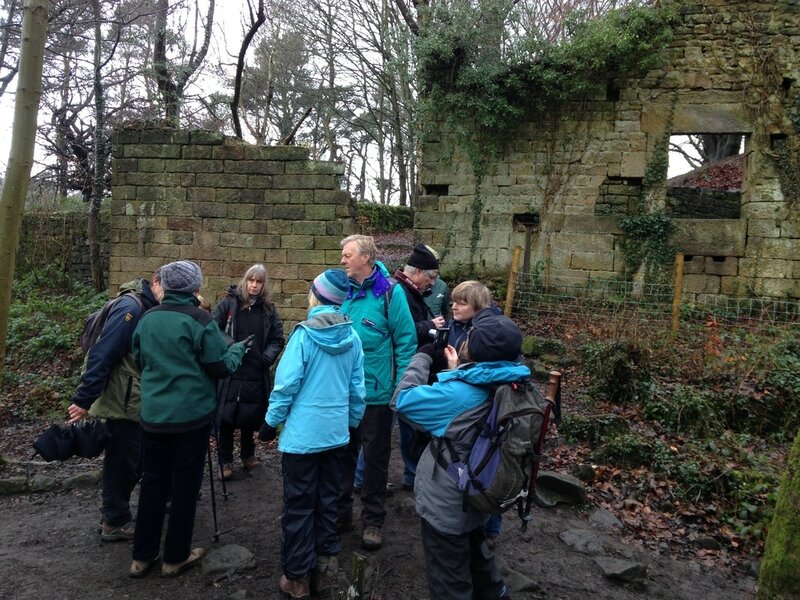 Another well attended walk was led by John Baker as ann introduction to the archaeology of Ecclesall Woods exploring the visible clues to the history of the woods and how to recognise the different features. Sat. 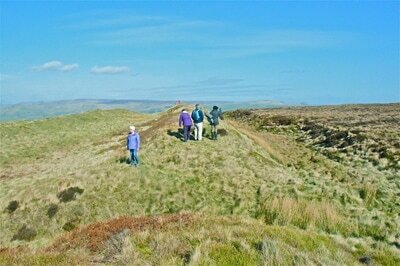 23rd Feb. - Roman Group walked around the Burbage Brook/Edge exploring the area for evidence of our Roman past. 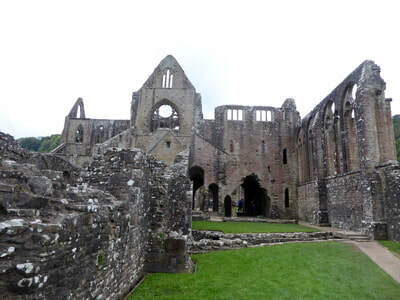 ​Ros works as an archaeologist for the National Trust and covers the East Midlands and Peak District. 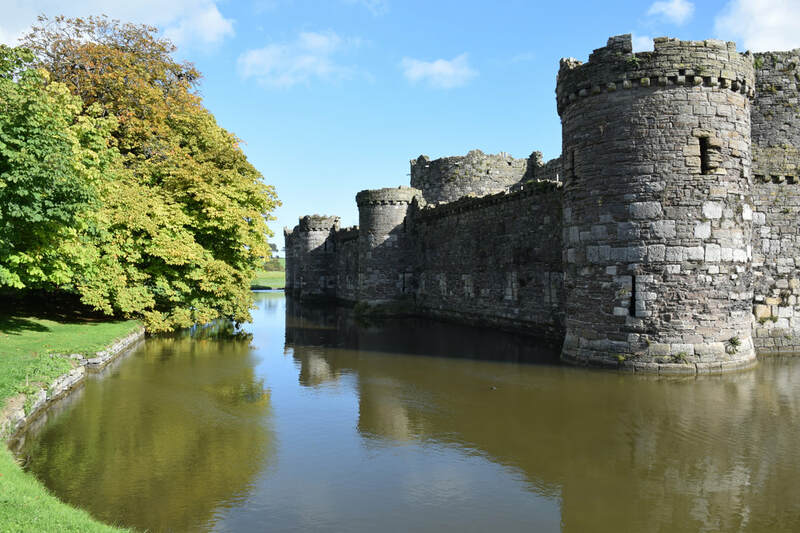 Her role involves advising regional properties on how to care for their archaeology, managing volunteers, and organising public engagement events. In her talk Ros giave an excellent and interesting insight into the archaeological activities and investigations undertaken on National Trust properties. It was very encouraging to hear how much effort and investment the National Trust puts into re-discovering their properties ancient past. With further discussion on the effect of the recent fires on Bigmoor and the evidence of activities of our ancient farmers and more recently those of the World War Two training manouvers. A big thank you to Ros for an excellent presentation! This proved a very successful event with circa 25 members attending providing a chance to meet other members, share experiences and learn about our activities and general things archaeological. It was so well received that we are planning to hold at least another coffee morning in March. Saturday 19th & Sunday 20th January Sheffield Heritage Fair. The Time Travellers provided a stand at the Sheffield Heritage Fair which was extremely well attended by members of the public young and old. It provided us with a great opportunity to promote our group and to show case the success and findings of our HLF funded project at Whirlow Hall Farm. We made some very useful contacts for future activities as well so a successful weekends work! Tues. 22nd January - David Templeman gave an excellent talk on the subject of Sheffield's Old Deer Park. With circa 35-40 members and guests attending we listened with fascination as we learned about Deer Parks in general as well as our own specific and very large Deer Park of Sheffield. These Deer Parks were a display of wealth and power as well as a playground and production unit for venison and other meats/game. Big thanks to David for another excellent and informative talk. 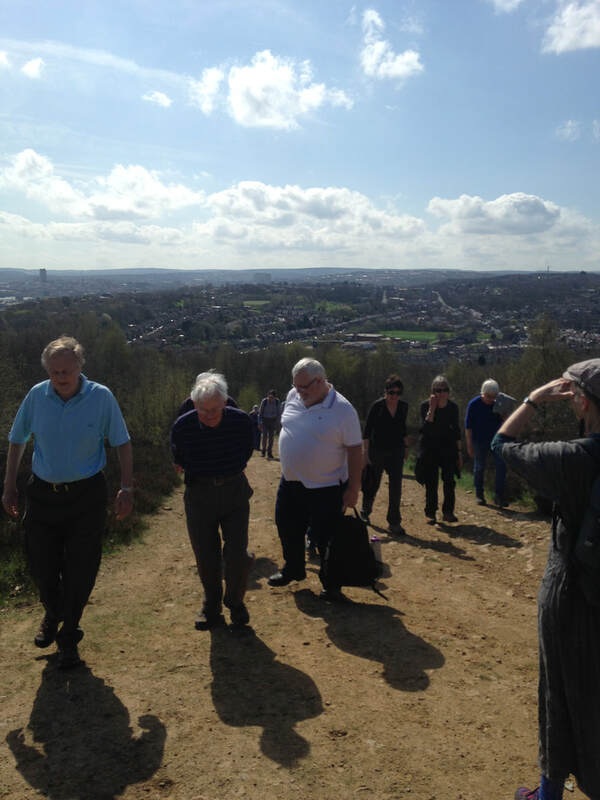 John Baker led 15 of us on an interesting walk providing an introduction to the varied archaeology of Ecclesall Woods exploring the visible clues to the history of the woods and how to recognise the different features. This will be repeated in the near future due to the high interest in the history and archaeology of Ecclesall Woods . Fri. 21st December - Winter Solstice Social 45 members and partners had a great evening enjoying their curry and chatting with fellow members, working on the Quizz together and attempting to win prizes. Then of course Dorne's amusing review of our activities in 2018. Mon. 26th November Try your hand at Dowsing a group met at the village hall in Over Haddon for an 11:00 am start. 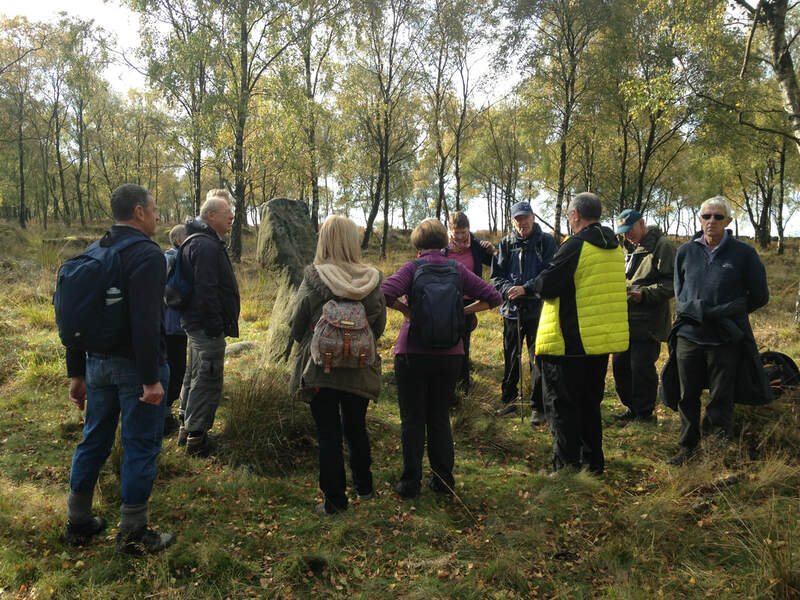 Wed. 21st Nov. 2018 - Stuart Nunn, a Time Travellers member and volunteer with the archaeology team at the Eastern Moors Partnership led 12 intrepid members on a cold autumnal day over Totley Moor. We saw evidence of coal, canister and fire clay mining. The location of brick kilns and sighting towers for surveying for the construction of the Totley Tunnel. Finally, zipping back through time to the bronze age, a double ring cairn with its five cremated burials dating from circa 1500-1000 BC. 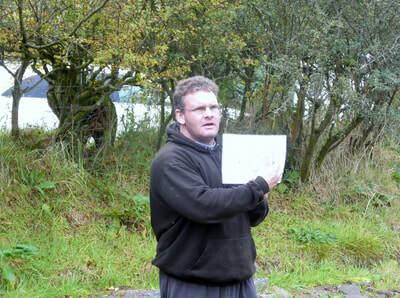 Big thanks to Stuart for a truly interesting, historical walk. Attended by thirty plus people, our member, Vince Boulter gave a very interesting, enjoyable and amusing perspective on the earliest cave paintings from Lascaux and Chauvet in France and Creswell Crags. He discussed why and how he thinks they were made. We were also shown mobile 'art' figurines and the oldest musical instruments found. Vince also brought along some 'home made' examples. Big thanks to Vince for a great talk! Mili Rajic, Wessex Archaeology’s project manager, gave a fascinating and enthusiastic talk to 60 members and visitors, focusing on recent results of the archaeological excavation of the site of Sheffield Castle. 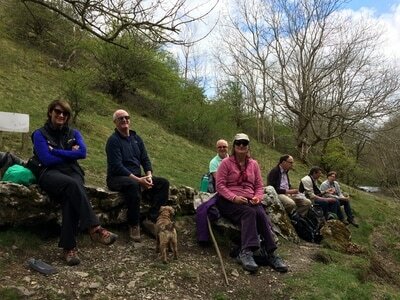 Robert Allcroft and Alan Stewart led 11 members on an archaeological walk on Gardoms Edge on a beautiful sunny day. Sights seen, apart from the scenery, included the Three Ships on Birchin Edge, rock art, bronze age hut circles, a linear feature of clay lined pits, cairns, standing stones, a mill stone quarry, Meg's wall, the Three Men, a ring cairn, site of the old trunk road and finally a welcomed pint in the Robin Hood. 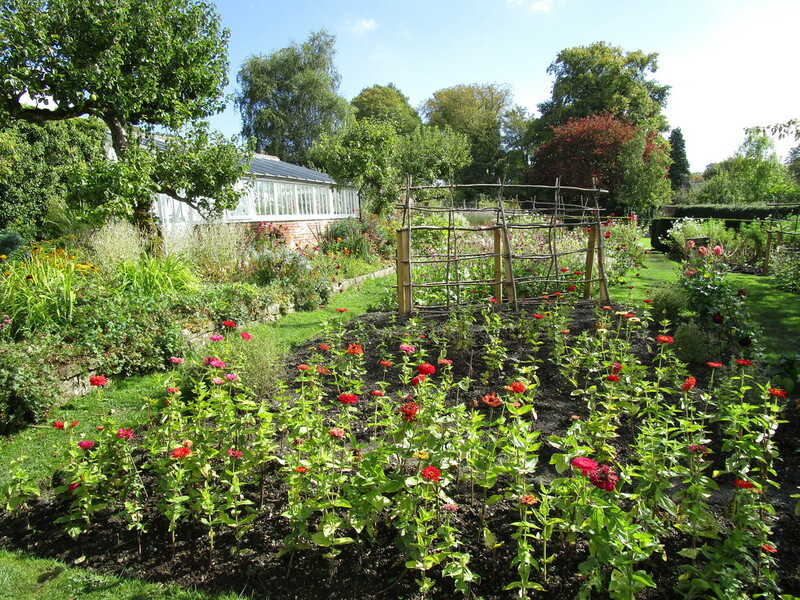 About 14 of us took part in field walking Horti field at Whirlow Hall Farm. The haul included some 10 pieces of flint or flint flakes but no clearly defined tools this time. These were bagged along with other less exciting pieces of old iron nails, slag etc. Then, of course, not collected but observed a vast array of clay pipe stems. Still we all had a therapeutic time searching in anticipation of another major find, left hidden for another day! 43 members and partners attended The famous Whirlow BBQ hosted at Whirlow Hall Farm. An enjoyable social event despite the cold windy evening. Thankfully we could retreat from the weather into the warmth of the Cafe for our meal and a good old chin-wag with fellow members and friends. Thurs. 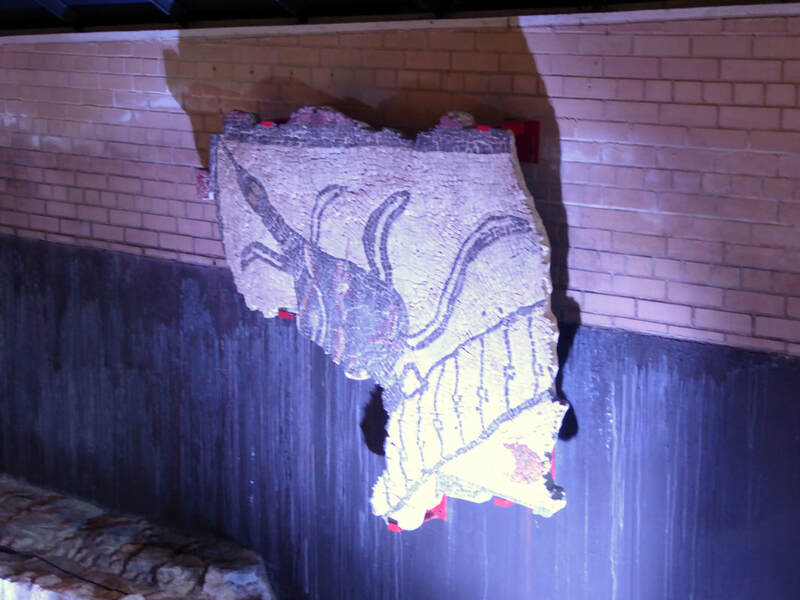 27th Sept. 2018 - Sheffield Castle Dig visit, the second tour of the Sheffield Castle excavations was equally well received. A big thank you goes to Dorne and Martin Coggins for arranging a perfectly co-ordinated and action packed away trip. 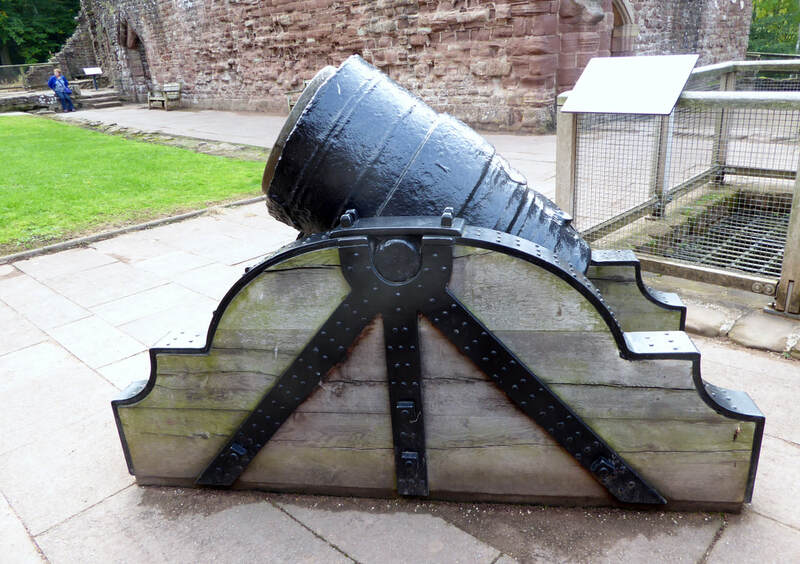 12 members travelled first to Chester where we had an entertaining tour of Historic Chester, walking the walls and including a visit to the basement of Pret-a-Manger where we could see Roman column bases of what must have been a magnificent building. Then onto a lovely hotel on Anglsey, Nant Yr Odyn Country Hotel. Day two started with a visit to the "never finished" Beaumaris castle followed by a visit and lunch at the Oriel Yns Mon visitor centre. This provided some background to Anglsey's rich past. 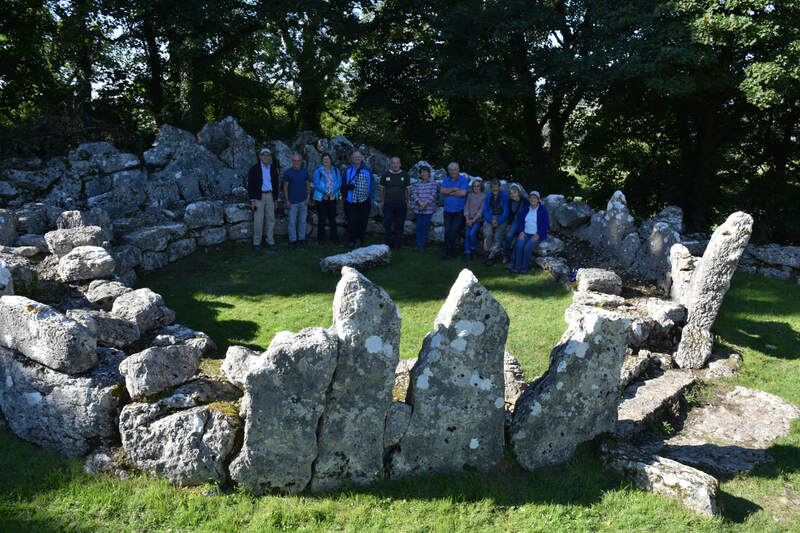 Then we dashed further back in time to visit the fabulously atmospheric Din Lligwy, a settlement of the Romano-britsh period, stopping first to take in the Din Lligwy Cromlech. Day three saw a quick visit to Castell Bryn Gwyn henge monument on the way to Caernarvon Castle where we were given an excellent guided tour. 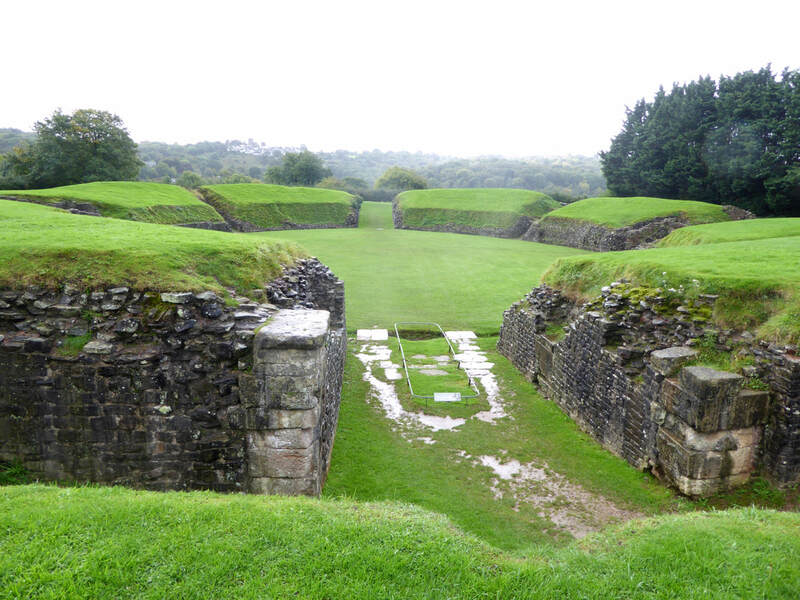 Then on to Segontium Roman Fort on a hill behind Caernarvon with great views over Anglsey and back towards Snowdonia. 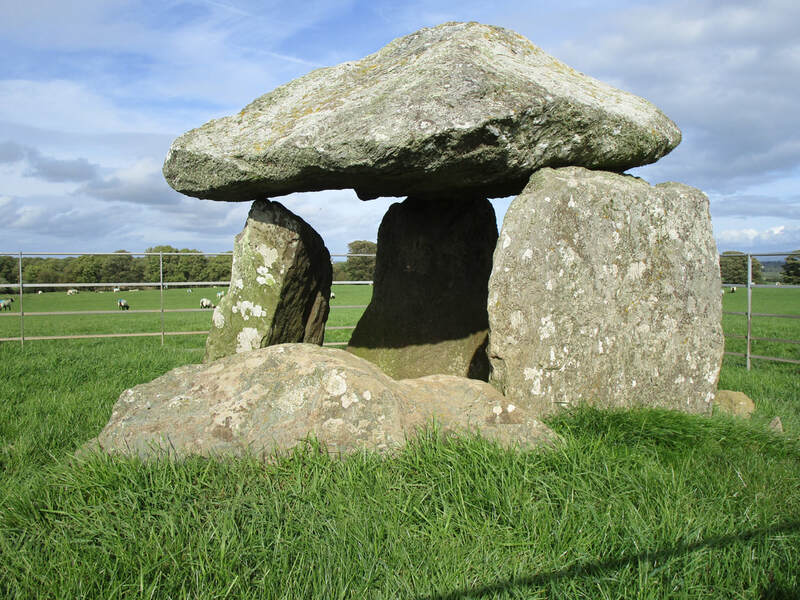 Then back to Angelsey to visit the passage grave of Bryn Celli Ddu, aligned with the mid-summer's rising sun and the Bodwyr burial chamber. 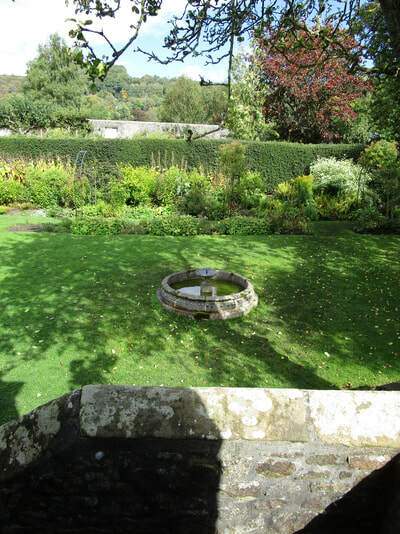 For some a fleeting visit to a National Trust property famous for its red squirrels before returning to the hotel. Returning home on day four via the most amazing and interesting site of all (in my opinion), the bronze age copper mines on the Great Orme headland. See more photos in our photo library. The day was well attended and started with an introduction to the site, then a lecture on Ice Age Archaeology in the Education suite, followed by lunch and a tour of Pin Hole Cave*. Where one could see tiny bones from creatures past in the sediments clinging to the walls of the cave. We then returned to the visitor centre for a guided tour of the artefacts in the archives. prompted further exploration. Between 1986 and 1989 modern techniques were used and uncovered a rich collection of artefacts and animal bones. 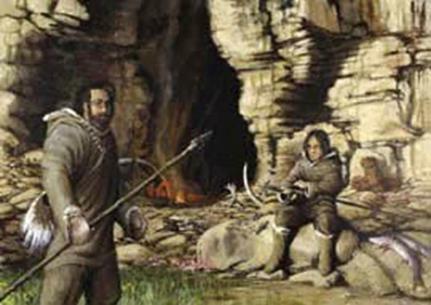 Neanderthals were the first people to use this cave while hunting reindeer in the Creswell area. They left behind groups of flint and quartzite tools made between 60,000 and 40,000 years ago. Later during the Ice Age people used this site during the Early Upper Palaeolithic between 40,000 and 28,000 years ago and during the Late Upper Palaeolithic about 12,500 years ago. Artefactual evidence from the most recent period include examples of flint, bone and ivory tools as well as two engraved bones, the 'Pin Hole Man' and a rib with a cross hatched design. 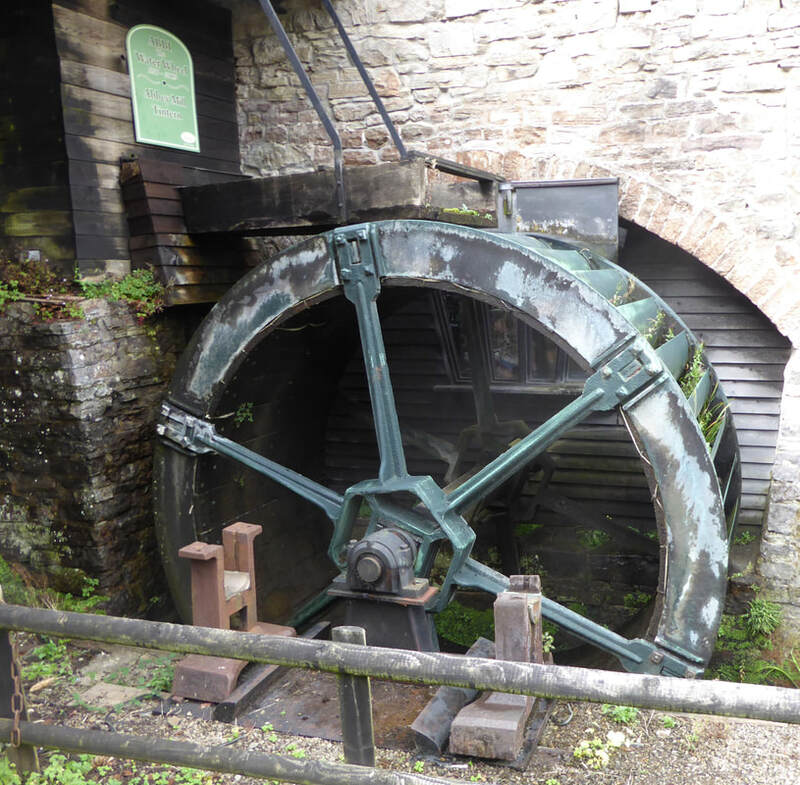 Six of us had a pleasant stroll through Froggatt woods and up the bank passing overgrown slag heaps and remnants from the mill to find the White Coal kiln. The kiln as intact as any we have seen is located next to the mill's water channel leading from the small dam higher up the hillside to the water wheel which we believe was located at the back of the lead mill and powered its bellows etc. This was followed by an enjoyable swift pint in the Chequers pub before returning home. 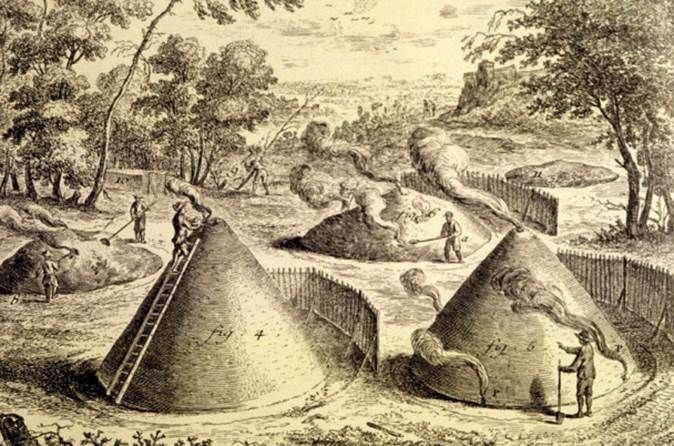 This is definitely the best example of a White Coal Kiln in this area. 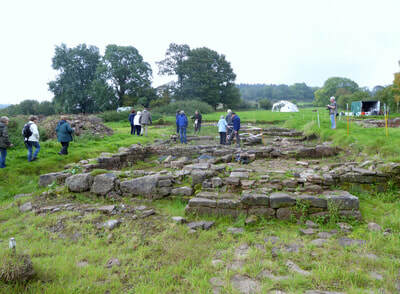 Thurs 10th, Fri. 11th, Tues. 15th, Wed. 16th May - Excavations were held at Whirlow Hall Farm. 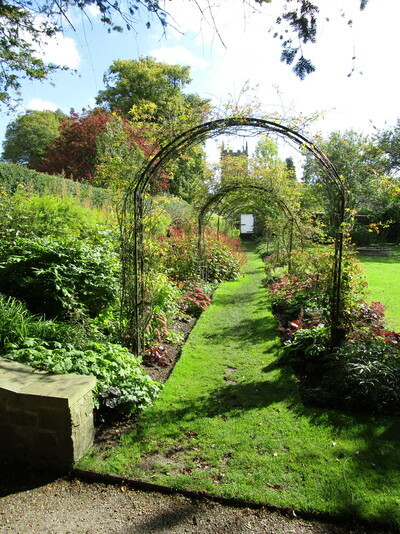 This first period was primarily organised for archaeology students at the University of Sheffield, but The Time Travellers were also invited to participate in the excavation. In addition, The Time Travellers spent some time back in the large trench that we excavated in during 2011 and 2016. Essentially, this was tidying up the existing surface level as part of a long term preservation plan. Sat. 28/04/18 - The Roman Landscape Group organised a walk looking at the potential Roman routeway through the Longshaw estate. 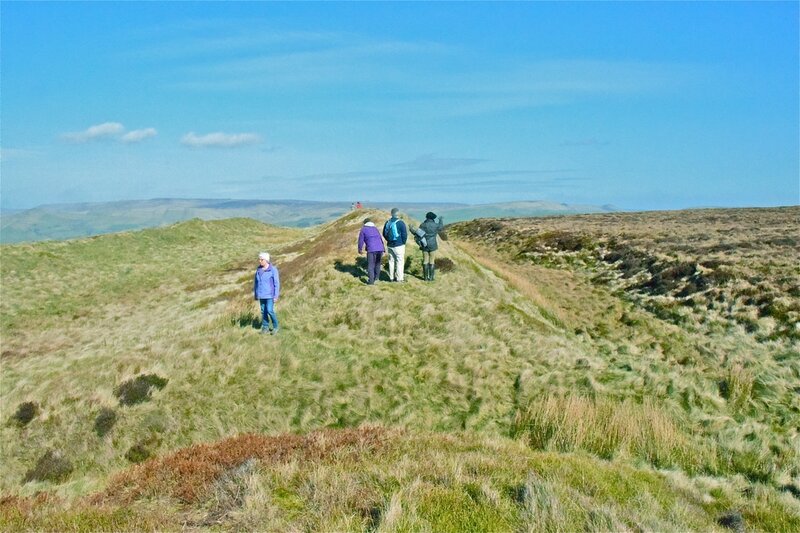 Wed. 18/04/2018 - 26 took part in an interesting tour of Wincobank Hill Iron Age Fort, with David Green of the Friends of Wincobank Hill. 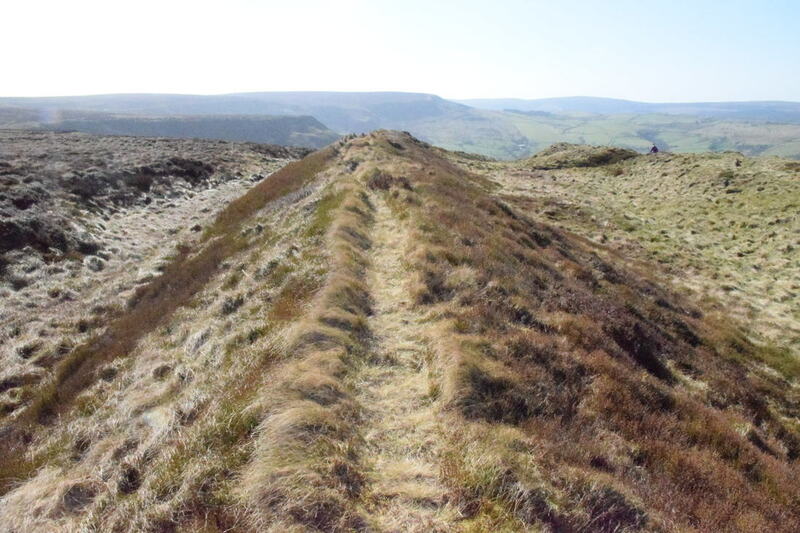 The vitrified Iron age Wincobank Hillfort is a Scheduled Monument. Surrounded by ancient woodland of oak, beech and birch, it occupies a commanding position on the hilltop overlooking the Lower Don Valley. 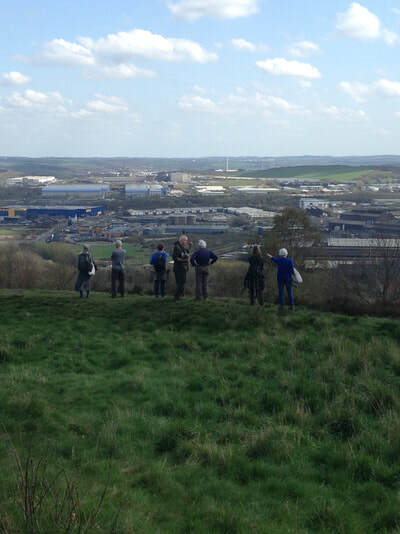 There are fabulous views over Sheffield's industrial landscape. Thurs. 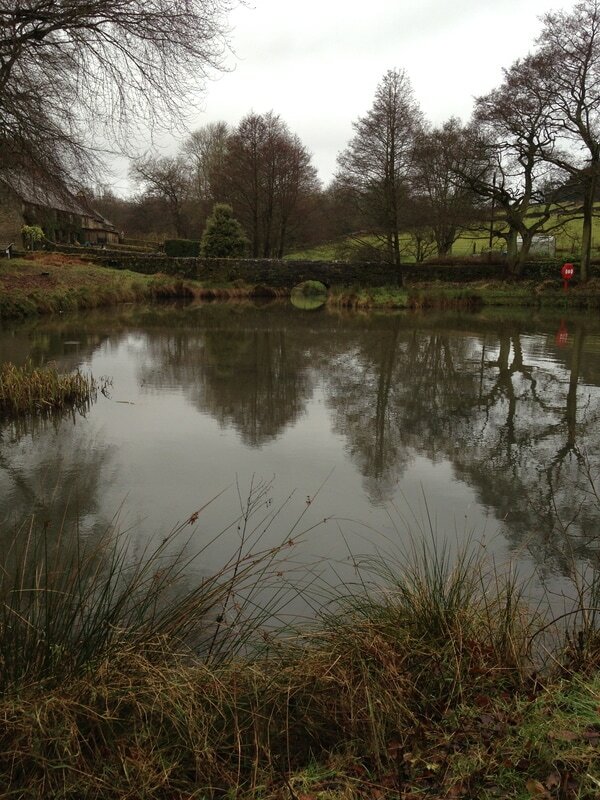 22/02/2018 - ​We had our first opportunity of 2018 to do a spot of field walking at Whirlow Hall Farm. 17 intrepid fieldwalkers faced a cold wind to find both pre-historic flints and an unusual penny token issued by IK Pickard in 1812. It has markings of Hull Lead Works on one face and will be made of copper. Apparently the Mint weren't producing low denomination coins at that time and it was quite common for rich industrials to produce their own. I K Pickard was a merchant and barrister from Hull who apparently got a taste for gambling and died in 'reduced circumstances' in 1843. Tues. 30/01/2018 - Medicine Through Time; From Stones To Somnoplasty an excellent talk on Ancient Medicines was given by Lyndsey Haynes. Not only did the talk cover the key aspects of ancient medicine from the Stone Age through ancient Egyptians, Greeks, Romans, the Dark and Medieval ages right up to today but also put those medical developments into their social context and the beliefs of the relevant period. Tues. 19/12/17 The Winter Solstice Social for members and their partners was an enjoyable event, attended by 45 members/partners for a tasty pie and pies supper followed by caramelised clementine and pomegranate pavlova along with quiz, Dorne's amusing review of our 2017 activities, raffle etc. The excellent meat and potato pie (there was a veggie option) was sourced from Totley's Liberty Foods, highly recommended. 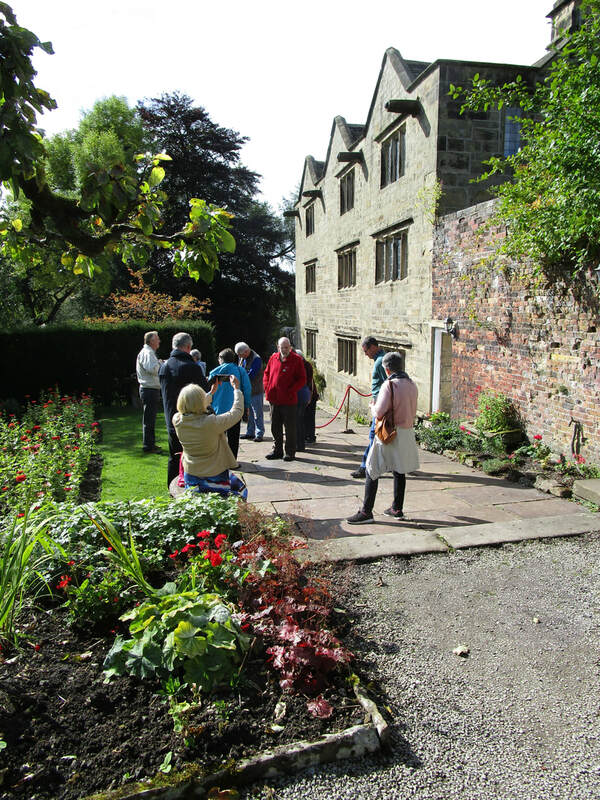 Tues. 14/11/17 Talk on Sheffield In Tudor and Stuart Times - This was an excellent illustrated talk by David Templeman an Elizabethan historian and Chairman of the Friends of Sheffield Manor Lodge. Tues. 10/10/17 - Talk on the Archaeology Of Castleton this was a well attended, fascinating and informative talk by Colin Merrony lead archaeologist on the archaeological excavations held in Castleton in recent years. Fri. 22/09/2017 - Eyam Village Tour - we started with a visit to the lovely little museum focussing on the impact of the plague, but with other interesting first world war displays. 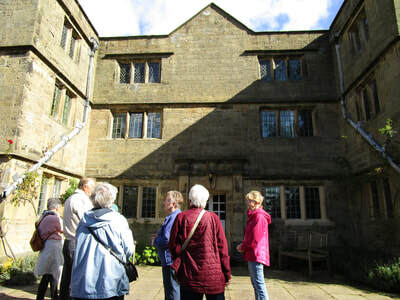 This was followed by an excellent guided tour of Eyam Hall by one of our members, Cathy Jackson. Then a spot of lunch and after an excellent, interesting and humorous guided tour of this unique local village. All in all a great day out. Sun. 10/09/2017 - Whirlow Hall Farm Trust Summer Fayre - our stand was well attended with many hearing of the discoveries of Sheffield's earliest past on the fields of Whirlow. Whilst the highlight was an archaeological dig experience for the kids who all really seemed to enjoy the excitement of finding their very own stone arrow head or "Roman coin". Tues. 15/08/17 - Summer Social event - Members and partners had a very social evening meal at La Scala. A three course, delicious Italian meal. So, t'was good food, good company, good evening! Sun. 30th July - well attended Heritage tours of Whirlow Hall Farm guided by The Time Travellers as an activity for "The Festival Of Archaeology". There were two sessions: 10:00 and 13:30. Tues. 18/07/17- An excellent and informative talk on The Brigantes In Yorkshire and their relationship with the Romans by Allan Wilson. Allan lectures regularly on archaeological themes where he brings in his extensive knowledge of European Archaeological sites as well as those closer to home. 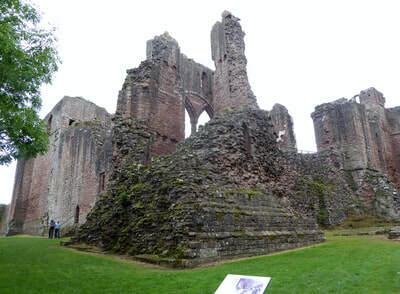 Wed. 14th June 2017 - Newark Trip - A must-see castle and visitor’s centre if members haven’t visited Newark recently. 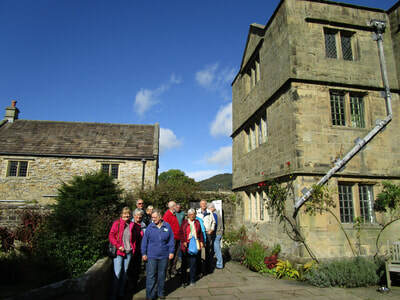 11 of us headed for Newark on Wednesday 14th June in glorious sunshine for a visit first of all to Newark Castle – one of the ones that Cromwell knocked about a bit. We were met by Floss, the Castle Warden who took us into the parts not generally accessible to the public – the Turrets and Undercroft areas. 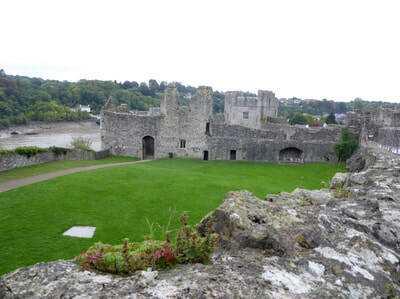 Newark Castle oozes history being amongst other things the place where King John died and also with strong links to the Knights Templars. Newark Castle is currently applying for an HLF grant to roof in the main turret and thus create even more display areas. Newark Castle isn’t strictly a Castle but rather a Bishop’s Palace albeit heavily fortified by Bishop Alexander. And who knew the reason for the bold jug handle decoration? We didn’t…… until Floss explained it was to distinguish ale jug from ‘piss-pot’. After lunch we then toured the National Civil War Centre which is newly created beside the Palace Theatre on Appletongate. A fascinating place currently showing a gruesome Civil War medical exhibition, a T.E. Lawrence exhibition ( Lawrence of Arabia started as an Archaeologist ) as well as the in-depth Civil War material. Sun. 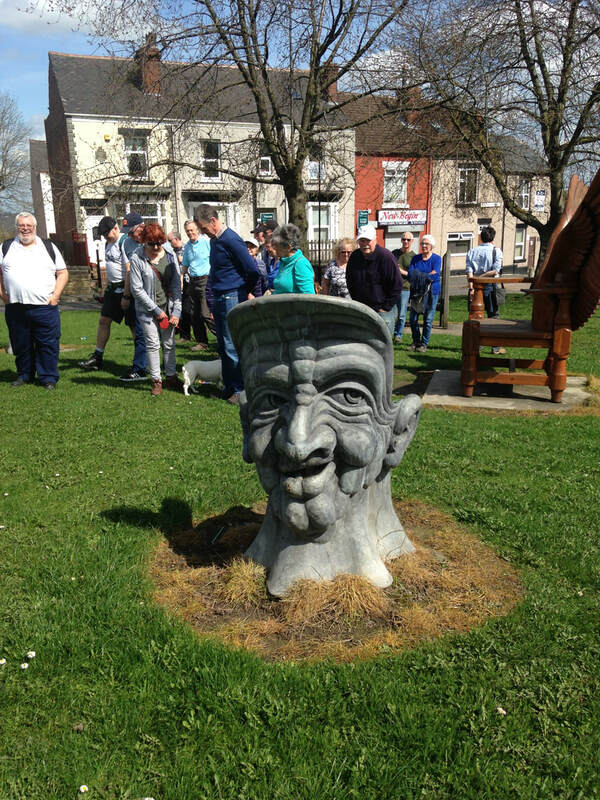 21/05/2017 - Free Family Heritage Day - This Heritage Lottery Funded event was a great success and took place in fabulous weather after an earlier week of rain! Sun shines on the righteous and The Time Travellers!! We had between 500-550 visitors of all ages with many young families which was just who we hoped would come along and join in. With the volunteers and other participants there were probably over 600 people involved in the heritage day. It was great to see the kids interest and enjoyment in the outdoors and involved with their earliest heritage. They all loved the friendly "Dancing Bear", seeing the craftspeople at work, getting their cards stamped by the ancestors from all ages and of course taking part in an archaeological dig where the lucky ones unearthed stone arrowheads and roman coins. The feedback received so far has been really positive. So a big thank you and well done to the many who helped make the day such a success. Especially to Dorne who both conceived and delivered the day ably assisted by Nigel and the rest of us too many to mention. Fri. 28/04/2017 - Lathkill Dale Archaeological Walk - eight of us had a fabulous walk through Lathkill Dale in beautiful weather taking in the flora, fauna and the remains of past industry with evidence of quarrying and mining. Thanks to Michael, our guide, for a great day out! Tues. 11/04/17 - Talk by Dr Clive Waddington - Rescued From The Sea - Excavations On The North East Coast and AGM - we had a fascinating talk by Clive on the incredible excavation at Low Hauxley on the Northumbrian Coast, which provided finds from the mesolithic, neolithic, bronze aged Beaker peoples and their burial cists and cairns, right through to the Romano British period set in a context of early migrations of peoples from the continent, later use of the site over thousands of years and the impact of major storm and Tsunami event. Thanks Clive for an enjoyable evening and a great tale. This was followed by Mandy's fabulous cup cakes and tea and our AGM attended by nearly 50 members. Sat. 08/04/17 The visit to Chelmorton was both interesting and enjoyed in brilliant sunshine! The historic church was visited and then we did a visual survey of the ancient (believed to be Romano-British) settlement. Clear traces of old enclosure walls and what we believe to be hut platforms were visible along with other features. Those who could went for lunch in the local pub which is recommended. Tues. 04/04/17. Field walking at Whirlow got off to a chilly but successful start today. A large group of The Time Travellers' members walked a new field to us and we managed to find a good collection of flints, including a very impressive blade picked up by Marilyn. In addition we found a couple of pottery sherds and some interesting glass fragments that might, or might not , be significant. ​We'll be back at Whirlow as soon as new fields are ploughed so keep an eye on our Events Page. Thurs. 30/03/2017 The talk by Dr. Clive Waddington on the HLF funded Whirlow Hall Farm archaeological projects held in 2011 & 2016 was both excellent and set the discoveries made in the context of the Roman occupation and its relationship with the local tribes at the time the enclosure was occupied. ​The talk was extremely well attended with over 200 filling the hall! Big thank you to Clive and the MITIE team at King Ecgberts for making this a success. 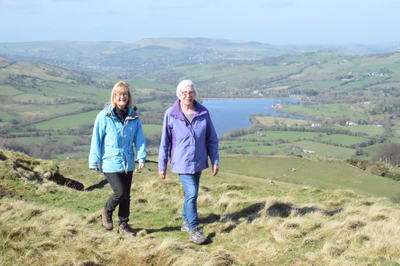 ​ Wed. 15/03/17- 15 of us visited The Bull Ring neolithic henge monument at Dove Holes followed by a steep climb up to Castle Naze promontory iron age hill fort. 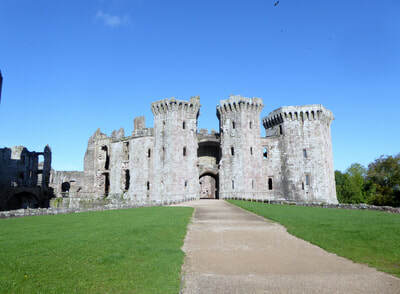 Both sites are spectacular especially as we saw them on a brilliant sunny day. I also understand that those who lunched at the pub afterwards had a convivial time with both good food and good beer!! Tues. 07/03/17 - Talk held on "The Formation Of Yorkshire" by Vince Boulter. 19:45 at Dore Old School. Excellent, lively and enthusiastic talk attended by nearly 50. Thanks Vince! 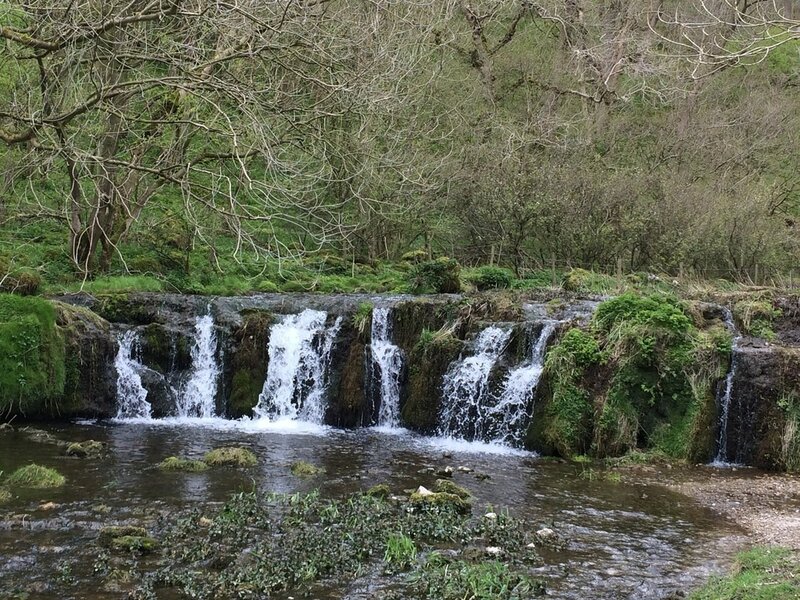 Sat 28/2/17 Lumsdale Valley and Cromford Mill Trip. 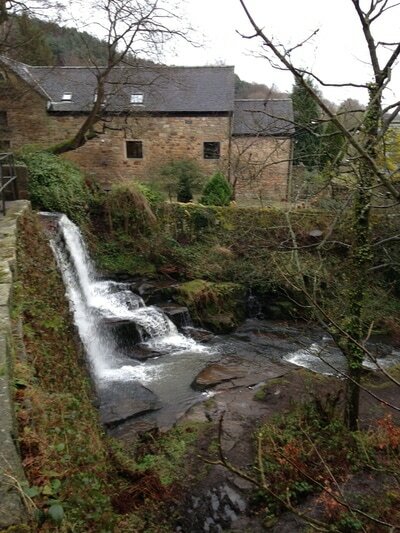 A wooded go rge of outstanding natural beauty with stone mill ruins, waterwheel pits, mill ponds and waterfalls. The little-known sites are reckoned to be some of the best in Britain, if not Europe. Sat. 04/02/17 - Clearing site near Strawberry Lee, Totley prior to survey. Volunteers interested in taking part contact Glynn Burgin.